The DP Calculator Preservation Evaluation is based on IPI’s Preservation Metrics™ which were developed to transform temperature and relative humidity data into quantitative numerical measures of material decay risk. Each combination of T, RH and DP determines the environmental rating for four major forms of material decay—natural aging or chemical decay, mechanical damage or dimensional change, mold risk, and metal corrosion. Note that these ratings evaluate a static condition and don’t take change over time into consideration. The Environmental Ratings and Preservation Metrics would vary if you were evaluating data collected over a period of time. Hygroscopic (water-absorbing) materials change size and shape depending on the amount of water they contain. These physical reactions are based on the amount of moisture in the air (RH). Maximum %EMC (≤ 12.5%) indicates a damp environment while Minimum %EMC (≤ 5%) identifies a dry environment. These conditions, as well as wide and/or frequent fluctuations can result in mechanical damage. The MRF represents the risk of mold germination and subsequent growth. 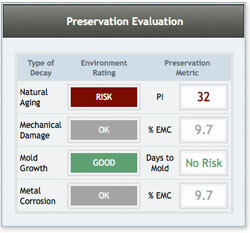 A value of 0.5 or less indicates an environment with little or no risk of biological decay. 0.5 indicates that mold spores are half way to germination. In a real-life situation the environment would be evaluated over time to create a running sum of progress toward mold germination.